New gimmicks are popping up daily and the world of tattoo certainly is no stranger to them. Is this a good thing or a bad thing? It’s hard to say. One would think that tattoos are relatively safe from gimmicky gimmick type stuff (did I just say “gimmicky gimmick”? I did. ), given the very nature of tattoos being so permanent and all that stuff. It would seem kind of difficult to throw gimmicks into something that basically is what it is in the way that a tattoo is what it is. Still, it happens. The latest gimmick to hit the tattoo scene are the augmented reality codes. Augmented reality codes are the little black boxes that can be found on everything from baseball cards to magazines to clothing. What happens is that you hold the image of the little black augmented reality box up to your webcam and this image then passes through all those tubes and chutes that make up the internet to bring you additional content. It’s sort of like bonus features on a DVD. Taking its cue from this sort of technology, Argentinian company ThinkAnApp is the first to create an Augmented Reality tattoo. From what I can see it’s a very basic attempt, but basically the company recruited a volunteer to be tattooed with an AR design. 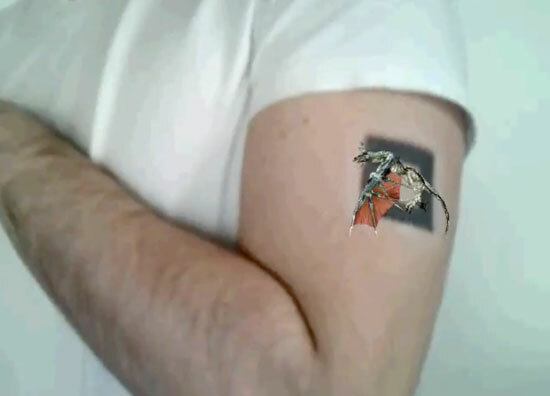 When this tattoo, which looks like a black picture frame is placed in front of a computer webcam on a computer that is running the ThinkAnApp software, an animated 3D dragon appears (on the monitor, of course) and floats around the perimeters of the tattoo. If this sounds kind of cheesy to you, that’s probably because it is. But if it also sounds kind of cool to you and that maybe this sort of technology will be refined in the not so distant future, well you could also be right. Yes it’s gimmicky and it’s a little bit impractical, but hey, that doesn’t mean that if it becomes a perfected art form that it won’t totally take off. Considering the revival that 3D is currently having in Hollywood and with companies like Sony selling 3D flatscreen TV’s, it certainly can’t be much longer before people are lining up to get their very own custom made augmented reality tattoo.